The star player for the winning side was Deepak Hooda who scored three super raids and ended with 16 points for the Pune side and as for UP Yoddha, Rishank Devadiga contributed with nine take points. The Pro Kabaddi League action was in full swing as Puneri Paltan pipped UP Yoddha 34-33 in a close encounter. The side from UP mounted a strong challenge in the last minute of the game but fell short by a point. While in the other match Jaipur Pink Panthers rode on a solid defensive performance to beat Tamil Thalaivas 27-26 inter-zone challenge. The fans witnessed an end-to-end match during which both teams scored the equal number of raid and tackle points but in the end, it was Jaipur's experience that pushed them over the line in the end. Jaipur Pink Panthers have 43 points from 14 matches are now fifth in Zone A table. 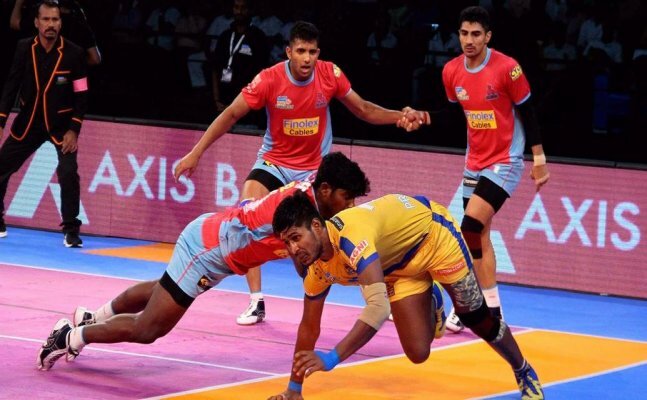 Tamil Thalaivas are bottom of the table with 33 points from 15 matches in Zone B.